The first benefit society in England was established in 1775. Initially unrecognised by English law, benefit societies were co-operative savings clubs that facilitated their members buying houses. Once all members had bought property, the societies would shut down. They were particularly popular in the north of the country. The Regulation of Benefit Building Societies Act was passed by Parliament in 1836, granting official recognition to these societies for the first time. 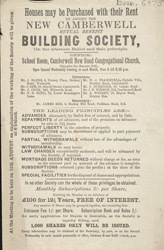 By 1860 there were over 27,500 building societies around the country.